KIEV, Ukraine -- Vitali Klitschko, Ukraine's popular politician and world heavyweight boxing champ, said Monday opposition parties could decide on a challenger to President Viktor Yanukovych in a "couple of months". Vitaly Klitschko, leader of the Ukrainian opposition UDAR (Punch) party. 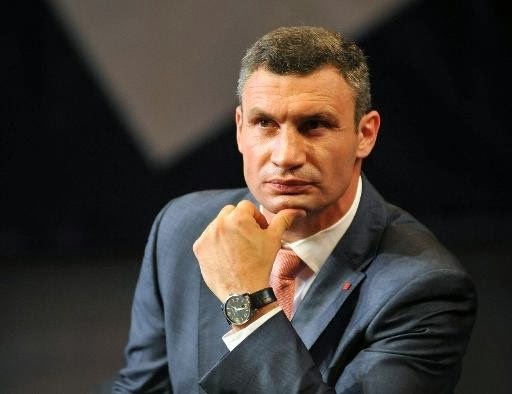 Klitschko, 42, whose party finished third in the 2012 parliamentary elections, said he was thinking about running against Yanukovych, but insisted solid support from all opposition parties would be key to his decision. "It is very important to have (a) united candidate" with the "biggest chance to win," he told reporters in Lithuania, speaking alongside other Ukraine opposition leaders. "We need (a) couple of months more," he said, when asked by AFP about a potential date. This summer Klitschko, who has the nickname of "Dr Ironfist", edged ahead of Yanukovych among potential voters for the first time, according to a June study by the Kiev International Institute of Sociology. He got the backing of 16 percent of potential voters, as opposed to 14 percent for the president. Nearly half of the respondents said they currently had no preference or were against all the potential candidates named by the pollster. Besides Klitchko's UDAR (Punch) party, Ukraine has two other main opposition groups including the Batkivshchyna party of jailed ex-prime minister Yulia Tymoshenko's and the strongly nationalist Svoboda group. On Monday, top officials of all three were in Lithuania -- holder of the EU's half year rotating presidency - for talks on a free trade and association agreement Ukraine expects to sign with the EU in Vilnius in late November. Vitali, 42, currently holds the WBC heavyweight title. His younger brother Wladimir, 37, holds four heavyweight world titles.